When a river divides two states, where, exactly, is the boundary line? For Vermont and New Hampshire, that question was decided by the US Supreme Court in 1934. The court ruling ended a long-running dispute that began in 1917 when New Hampshire tried to tax a paper mill located partially in the bed of the Connecticut River near Bellows Falls. For decades, state law has required attorneys general from both states to "perambulate" the border every seven years to make sure the markers remain visible and accurate. 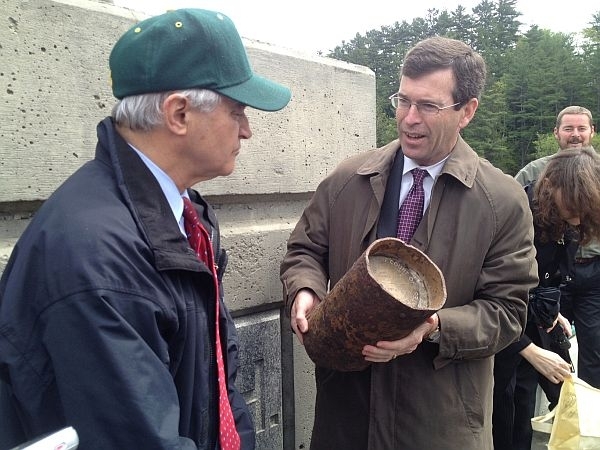 As a light rain fell on Monday, Vermont Attorney General Bill Sorrell and his New Hampshire counterpart, Mike Delaney, strolled toward each other from opposite ends of the bridge connecting Norwich and Hanover. "Greetings from New Hampshire, General Sorrell," Delaney called. "Always a pleasure," Sorrell answered. "Always a pleasure." "Have you moved this a little bit since the last time we were here?" Delaney asked, gesturing to the bridge. "You took that question right out of my mouth. That’s why the statutes call for the two of us to perambulate the border, and I think it’s a great day for perambulation," Sorrell replied. "It’s a terrific day for perambulation," Delaney told his counterpart. "You couldn’t have better weather for perambulation." Of course, the real work of surveying markers along the entire border falls to staffers from both states. The attorneys general treat the law more as a photo op, and stand-up-comedy. Sorrell accused New Hampshire of grabbing land and money from Vermont. "We had to go to the Supreme Court to protect ourselves from this over-reaching on the part of the Granite Staters," he complained. Delaney had a quick retort. "Well, there’s no question that New Hampshire has always had a reputation of trying to keep its tax rate low for its citizens. There’s no question about that." Delaney produced a boundary marker he claims Sorrell stole, and Sorrell gave Delaney a UVM cap so, Sorrell quipped, he could cheer "for a winning team." On a more serious note, the two men praised each others states for being good neighbors. As for who got the best deal in that ancient court settlement, they noted that Vermont lost territory, but New Hampshire now has to maintain bridges, though Vermont kicks in a proportionate share depending on where the low water mark lands. On this particular day, the boundary marker at that lower water mark was a little difficult to find among the weeds. But there it was. And the perambulation was complete for another seven years. The U.S. Border Patrol is getting some extra help watching the line with Canada in Vermont and upstate New York with help from local and state police officers in both states. A new commission promoting economic development in northern border regions of New York, Vermont, New Hampshire and Maine has won $1.5 million in federal funding.